I've spent most of my life in and out of kennels. Right now I'm the inhabitant, or as the French Poodle who jilted me would like to say, the habitué, of a literary halfway dog house on the coast. 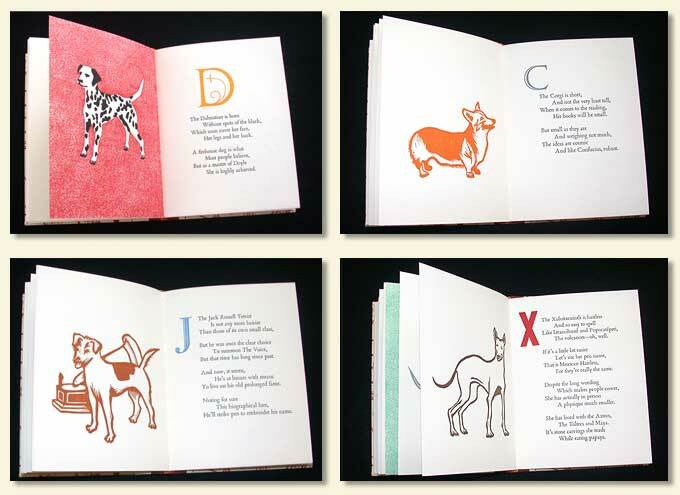 I can attest that each of these portraits you see in this alphabet book are near enough to the truth as you'll ever get. I should know. I edited the book. And, it is no coincidence that you'll find no French Poodles between these covers. Who wants to be plagued with readings from Proust while eating bone-shaped madeleines? But I do know these dogs. For example, take the Rottweiler. I bunked with one for three months. Do you know how long that is in dog's years? I'm not sure either, but it felt like a lifetime. My point is, he really is a control freak. Except for his tongue. It was about as out-of-control as you can imagine for a dog his size. I could simply go down the list, but I won't. I'd just get lost because, frankly, the alphabet confuses me no end. I've left those details to the printer who is also responsible for the so-called poetry. I supplied the facts, he supplied the words. And if it seemed to rhyme I left it in. Enough said. The illustrative portraits I like a lot. It's right up my alley. I approved every one in the book, and, believe me, I rejected a lot, too. First of all, no mongrels. I'm not saying there's no place in the world for cross-bred canis familiaris, but this is no documentary on abandoned, wayward dogs, is it? I'd give my second-to-the-last bone to one of them and all that, but that's someone else's movie. But more important, I've paid my dues. I've seen the inside of my last kennel. I'm trying to get all that behind me, go straight, find a good home with a backyard and a little grass or dirt; perhaps a trash can, maybe some plants and a gopher hole or two, and ponder the flea sitting on the end of my tail. Stay out of trouble. And hope I don't find a loose board in the fence wide enough to squeeze through. Again. But back to the book. You'll find my portrait here, of course, but I plan to stay what-do-you-call-it anonymous or ignominious or whatever. But I'm willing to talk about anyone else in the book. That Keeshond? You think the illustration is silly? You don't know the half of it. And, for the record, ballet is not my thing but it was the least silly drawing we could come up with. I'm not supposed to have favorites but, just the same, the Newfoundland is my kind of, well, dog—big, wet, and no nonsense. 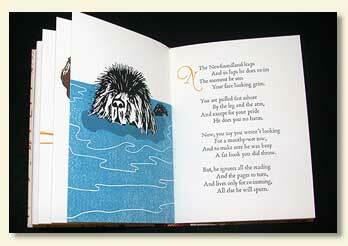 He doesn't read a lot but if you run into trouble away from shore, he's the one to be at your side, paws down. The thing is, there is something interesting about every one of these dog-eared confederates from the Airedale to the Zuchon and every one will amaze you. Okay, I'm kidding about the Zuchon. It's a lap dog. Alright, not only that, it's a "designer dog". What can I say? 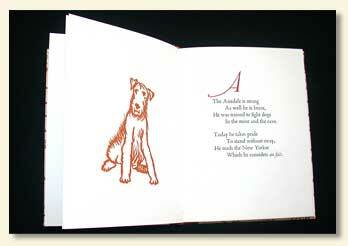 You find a dog that starts with Z and you can edit the next edition. Meanwhile, I've got to check the fence for loose boards. 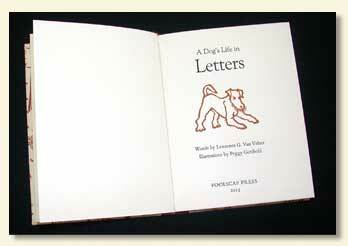 A Dog's Life in Letters is published in a first edition of 200 numbered copies. 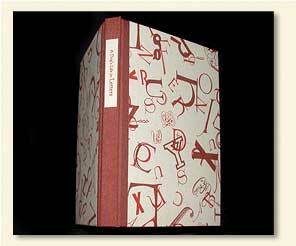 The book is 64 pages and measures 6 5/8 inches tall x 5 1/8 inches wide and is printed letterpress on Curtis Holcomb Cream text and hand-bound at the Press. 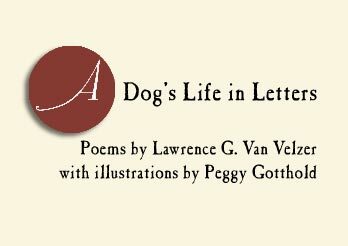 The poems are by Lawrence G. Van Velzer and the linoleum cut illustrations are by Peggy Gotthold. The price is $120.00 plus appropriate CA sales tax. Shipping is $10.00. 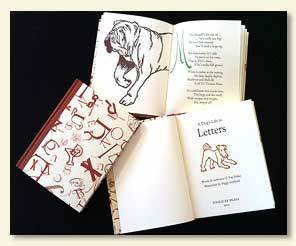 Orders may be placed by telephone, email or letter. Please include $15. for shipping and appropriate tax for California residents. Book dealer, institutional and Standing Order discounts are applied.